We think it's important to source from local sustainable suppliers. Sourced locally where ever possible, the menu consists of all day Light Lunches with fresh Cornish Crab and Mackerel, Cornish Cheeses and Meats. Freshly made Paninis and Sandwiches, Soups and our fantastic hand made Cornish Pasties.We also have a delicious selection of home made Cornish Cream Teas, Cakes and Cornish Ice Creams. A good selection of Teas and Freshly Ground Coffees,we also have a selection of Soft Drinks. No trip to Cornwall is complete without indulging in a Cornish Cream Tea. 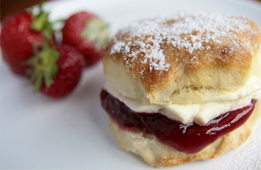 A couple of oven fresh scones sliced in two, topped with generous dollops of Jam and topped with Cornish Clotted Cream and washed down with a couple cups of Tea provide the perfect treat for any occasion.